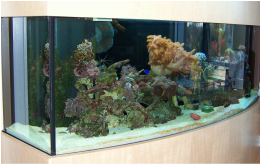 ProAquariums, serving Maryland Metro Area's residential and commercial aquariums. Project Improvement Plans: If ProAquariums is taking over an account previously serviced by another provider, we inspect the system carefully since ProAquariums inherits management risks. As needed, a Project Improvement Plan is prepared at no cost to our client. The only expense involved is remediation to correct specific problems.